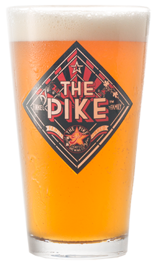 Pike Vita is an American beer, it has an alcohol content of 5.2%. What’s more Seattle than coffee and beer? Pike Vita is a fresh take on coffee beers; featuring single origin varietal Papua New Guinea coffee beans in a light blonde ale. The bright beer starts with coffee aromas and finishes with citrusy hop flavors. This is a collaborative brew between Pike Brewing and Seattle coffee roaster, Caffe Vita.